Earlier this month, Inuit leaders and others gathered in Ottawa to look back at the past 15 years and, more importantly, discuss Nunavut's future. With pressure growing to resolve many outstanding aboriginal treaty issues across Canada, it's worth looking at the Nunavut experience. 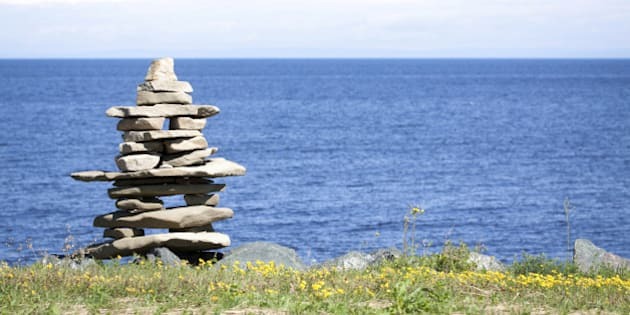 Inukshuk in front of the blue ocean, Canada. Emblem of the Olympic Winter Games 2010 Inukshuk was used in traditional caribou hunting by the indians. The second hand ticked toward midnight. Around the table the atmosphere was tense. High-level representatives from the federal government were wavering. It was the make-or-break moment for a deal that would change the face of Canada. On that night in July, 1993, the government of Canada still balked at the idea of giving Inuit people their own self-governed land. But with midnight looming it relented, signing an historic agreement that resolved a swath of Inuit land claims and led to the founding--15 years ago--of a new Canadian territory: Nunavut. Today, a generation of school children have never known a Canada without Nunavut. We spoke to some of the people who helped Nunavut come into existence about the territory's successes and challenges, and what lies ahead. Paul Quassa is Nunavut's education minister, but 15 years ago he was the Inuit chief negotiator. Terry Audla helped establish the new Nunavut government in 1999. He now heads Inuit Tapiriit Kanatami, a national Inuit organization. For Quassa and Audla, the great strength and success of the Nunavut agreement was giving Inuit control over their land and affairs. "We have Inuit ministers, making our own legislation that is Nunavut relevant," Quassa said. With this, Inuit created a system that better reflected their culture and traditional values. For example, Audla noted how the Nunavut parliament legislates by consensus, eschewing the adversarial partisan model of Canada's other federal and provincial governments. Like most aboriginal communities across Canada, Nunavut still faces a host of social and developmental issues: high unemployment and school dropout rates, and one of the highest suicide rates in the world. Walking through a grocery store in Iqaluit we experienced sticker shock at the astronomic food prices. We were warmly welcomed into tiny homes bursting at the rafters with people because of Nunavut's chronic housing shortage. However, with self-government, Quassa and Audla say Nunavut is better empowered to tackle these challenges than many other aboriginal communities. For example, to engage youth in education and reduce drop-out rates, the territory is using its power to "Nunavutize" the school curriculum, incorporating Inuit culture, history and language into education. With greater governmental control over the land, they believe Nunavut's Inuit people are also better placed than other aboriginal communities to manage natural resources, such as diamonds, ensuring they are developed sustainably and that Inuit communities benefit economically. Nunavut Premier Peter Taptuna told us he holds out great hope that Nunavut's vast mineral resources will bring new opportunities. "We are on the cusp of economic growth that is projected to outpace much of Canada," he predicted. While Nunavut must lead in addressing its own challenges, the rest of Canada can provide support. Quassa and Audla both drew parallels to the development of the Canadian railway in the 1800s. If "Arctic sovereignty"--which has become a catchphrase in Canadian politics-- is a national priority today, as Western expansion was back then, they argue it's time to drive new transportation links northward. "Canada was built by connecting from coast to coast (East to West.) Now we're coast to coast to coast," Quassa said. And Canada needs to live up to the commitments it makes to Nunavut. In an ongoing case, it has taken the federal government to court for breaking a promise to help monitor the territory's economic, social and environmental progress. Inuit leaders admit their territory is still young, coping with growing pains. There is a long road ahead to address issues like economic opportunity. The years to come will be a lesson for all Canada on the power of self-government to tackle the challenges facing our aboriginal people. This is the fourth in a four part series on aboriginal people and issues. Brothers Craig and Marc Kielburger founded a platform for social change that includes the international charity, Free The Children, the social enterprise, Me to We, and the youth empowerment movement, We Day.